Azaleas are upright growing flowering shrubs that produce some of the most beautiful flowers in existence. Azaleas need lots of moisture, good drainage and are hardy in the USDA Planting zones 4 to 10. Several varieties of azaleas are very tolerant of heat (such as the Aromi hybrids) and with more than 6,000 varieties available, there is one suited for nearly every Texas garden. Select a location. Azaleas grow best in soil that is rich in organic matter and can offer plenty of filtered light, according to Texas A&M University. Choose a location that can provide some morning sunlight but plenty of afternoon shade from the hot Texas sun. Cultivate the soil in the planting area by turning the soil over with a spade or a garden fork. Eliminate any objects, like rocks, sticks or roots, from the planting area. To help improve drainage in the heavy clay soil common throughout Texas, mix into the soil in the planting area a 2- to 3-inch layer of compost, peat moss, leaf mold, ground-up bark or expanded shale. Create a small mound in the center of the planting area that is between 6 and 10 inches tall and approximately 18 to 24 inches in diameter. The planting mound will help assure the azalea is provided excellent drainage. Level off the entire top of the mound you created. In the center of the mound, dig a planting hole for the azalea that is as wide and deep as the growing container. Remove the azalea from its growing container; lay the container on its side. Use a stout section of wood, a hammer or a trowel to strike down on the rim of the container until it loosens and you can slide it off the root ball. Set the root ball of the azalea into a bucket of water to soak for about 30 minutes. Then make three or four vertical cuts in the root ball with a sharp knife to help stimulate new growth. Plant the azalea in the previously created planting hole. Add more soil to the hole if necessary to ensure the top of the root ball is sitting about 1/2 to 1 inch above the rest of the soil in the planting area. Scoop in soil to fill the hole full. Spread a 2- to 3-inch layer of pine bark, or pine needles around the azalea but keep the mulch 1 1/2 to 2 inches away from the stem. A layer of mulch will help conserve moisture and keep the roots of azaleas cool, which is necessary for success growing azaleas in Texas. Fill up a 5-gallon bucket with water. Water the azalea slowly, letting the water gradually sink into the soil. Fertilize azaleas three times a year starting right after they bloom. Use a fertilizer especially made for acid-loving plants and use care to follow the directions provided. 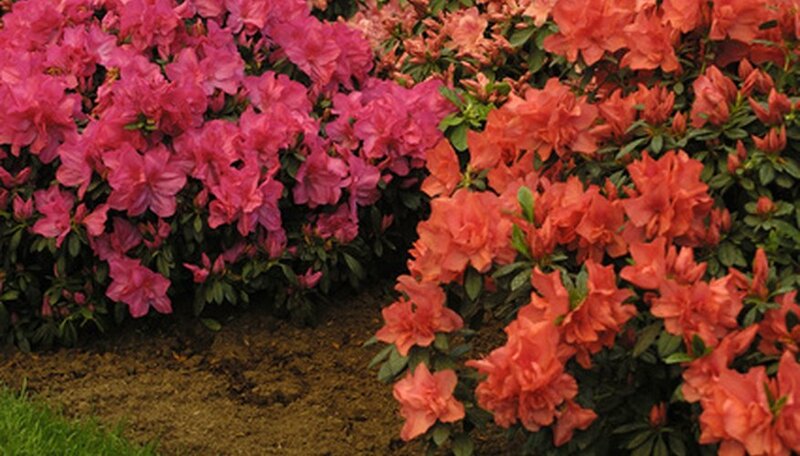 Azaleas are shallow rooted and require frequent watering during the Texas heat. Water azaleas once or twice a week, letting the water run slowly on each plant.